With Valentine’s Day fast approaching, you may be starting to wonder what kind of gift to surprise your sweetheart with this year. If you’re considering a proposal, congratulations! 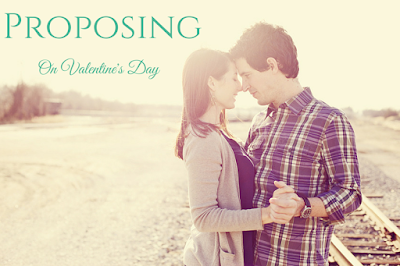 Proposing on Valentine’s Day can be an exciting way to begin the rest of your lives together. We know you probably have a few questions, which is why we’re here to let you know how to propose on Valentine’s Day. If you’ve decided that a proposal is the ideal Valentine’s Day surprise, we’re excited to help you get started! A proposal is the perfect way to celebrate your love for one another, and we want you to do it well. As with any other proposal, we recommend making a plan, keeping it realistic and sticking to your budget. But because it’s Valentine’s Day, you’ll want to pocket some additional advice before planning the big event. Because Valentine’s Day is celebrated widely and by nearly everyone young and old, proposing on February 14th could come across as unoriginal. That’s why we recommend that your proposal doesn’t feature any traditional Valentine’s Day decor. Forget the pinks and reds, the hearts and candies, and the teddy bears. Your relationship is as unique as you are, and it would be a shame to reduce it to an aisle at the local grocery store. Although you picked Valentine’s Day specifically to make a romantic gesture, remember that the two of you share a history that’s a lot more meaningful than a Hallmark moment. We therefore also strongly recommend that you avoid proposal clichés such as putting the ring into a champagne glass during dinner or, for that matter, proposing during dinner at a restaurant at all. Proposal clichés have been played out for years, so much so that they only ever continue to make appearances in terrible romantic comedies or telenovelas. But that doesn’t mean you can’t surprise your love with something spectacular. Depending on your tastes and preferences, consider staging a romantic proposal in a favorite spot with friends and family by your side, hire a private boat tour or bring a personal chef into your home to cook for you privately. Whatever you do, keep it personal and cliché-free and you’re guaranteed to surprise. If you’re worried about the surprise being ruined, you might be tempted to underplay Valentine’s Day as a way to smother any suspicions. Which brings us to our third bit of advice: Don’t go out of your way to underplay Valentine’s Day. If the two of you normally have plans and this year you’re claiming to “just want to stay at home to watch reruns,” chances are you’ll get into a tiff before the evening has even begun or you’ll end up with proposal pictures where at least one of you will be sporting $12 sweats from Costco. While you don’t have to spoil the surprise, it’s important to be up front that you have something special planned. This will ensure everyone is (somewhat) emotionally prepared and (definitely) appropriately dressed when the big moment comes. Remember that creating a moment of anticipation does not ruin a surprise, it merely makes the whole evening more exciting. Finally, if you’re nervous about proposing on Valentine’s Day, you’re not alone. Proposing, even when you’re 100 percent sure, can turn out to be a nerve-racking experience. Between planning and pulling it off, you might be worried that something could go wrong and ruin Valentine’s Day forever. But don’t work yourself into a frenzy just yet. Try to remember that you’ve done scarier, more complex things in life, and that you’re perfectly capable of showing someone you love a good, romantic time. When the day comes, treat it like any other; take a few deep breaths, think of the future and don’t forget to keep your sense of humor about it. If you have any tips for Valentine’s Day proposals, we’d love to hear from you. Comment below! valentine's day is romantic and fun! for the love birds out there <3 l enjoyed reading this fab content from you. have a blessed life and always keep that smile wide.